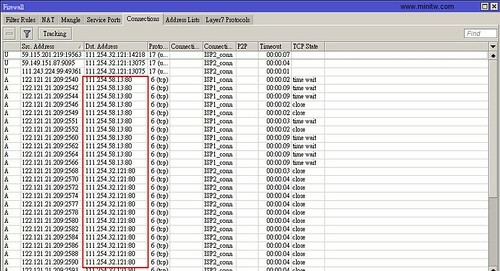 想請問一下，類似這種雙WAN的設定，在 /interface pppoe-client 這段裡面的「interface=LAN」不是應該指哪個實體port嗎? 還是我誤解了? RB450G 跟 3300B+ 設定真的差好多. 但是, 我喜歡 RB450G Firewall. 高達49000session. 請問有沒有辦法可以解決?? 是在 firewall 還是 bridge 做? 192.168.0.x 是我原先電腦設定好的, 一改 RB450G 我就不用改電腦資料了. 茶包兄: 請教一下,我依照您的設定已經成功的完成了2wan的設置. Thank you very much! 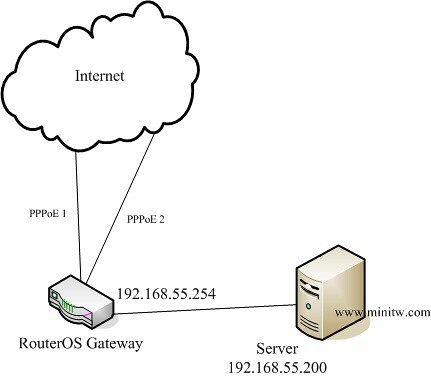 可是另一個問題來了,我的PPTP VPN只要是2WAN enabled,就撥不進去,將其中一個WAN disable, 就可以撥進來! 這.....是要還缺哪邊的設定呢? Thanks again! 謝謝您的回覆,您是不是指在firewall rule中只開放必要的port (GRE + 1723)就好了呢? 這樣是不是就不會有您說的安全性的問題? add action=accept chain=input comment="Allow PPTP" disabled=no dst-port=1723 protocol=tcp src-address-type=""
add action=masquerade chain=srcnat comment=Default disabled=no out-interface="Hinet-Fixed IP"
add action=masquerade chain=srcnat disabled=no out-interface="Hinet-Dyn IP"
我的mangle都是用prerouting, 改為您說的input, output就可以了! Thank you very very much! 很神奇的reboot以後,主線的ftp好了,IIS ftp預設沒有PASV,所以我現在從主線用no PASV的ftp client可以連進去,但是從第二條線用ftp client不管是有無開啟PASV都進不去,list出不來,可是我20跟21明明都有mapping過去..
另但另一條要dhcp 拿取ip 位置的線路gateway 指定名稱就不通了 要自己填上gateway 的ip , 有什麼辦法能解決嗎? 我有 pppoe relay (或 pppoe pass through)的需求, 也就是希望在RB750GL後的設備, 平常可以以DHCP方式取得private ip, 透過RB750GL的固一IP上網, 若有需要時, 只要改以 pppoe 撥號, 就可以取得 浮7的public ip 上網. 我對外是一線100M 的FTTH , 接在eth1上, eth2接一台8ports的switch hub, eth3接一台純AP, eth4, eth5 分別接一台NB及桌機, eth2 為 master, eth3~5 為slave, master皆指向eth2. 不得已, 只好冒味請教茶包兄, 還請茶包兄指點一下方向, 我再來試試看, 感謝! 另外, 我在方法二上參考你的blog文章想設upnp, 我把 port2上的 pppoe介面設為 external 的 upnp , 另外在 port3, port4 設為 internal 的 upnp, 但NB,桌機上的軟體都無法使用unpn 連線, 不知道是否有哪裡需要注意的呢? 謝謝! 但每台PC,NB 可以直接DHCP 取得 private ip上網, 若有需求的話, 也可以直接 pppoe 撥號, 取得 public ip 上網. 以上設定也供大家參考, 如果有需要 pppoe relay 或稱 pppoe pass throughput 可以參考上面那種設定方式囉. 我照這設定 都會進入webfig 沒辦法port mapping 這是什原因呢? ?